At CVS Health, we know the value of investing in the communities we serve, particularly in workforce development. One way we do so is through our Registered Apprenticeship program. By arming community members and potential job candidates with the tools they need to succeed in their careers, we are also ensuring that we have a strong pipeline of talented colleagues. 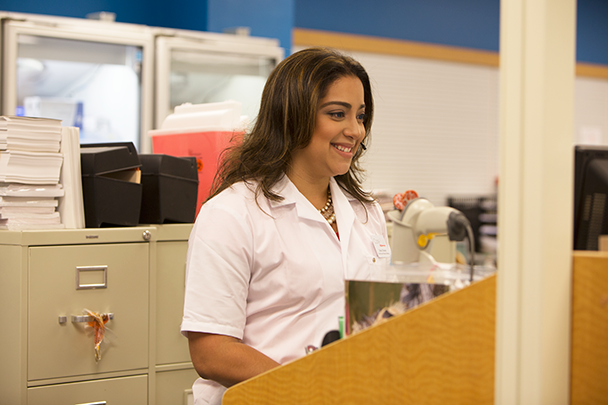 CVS Health first became involved with Registered Apprenticeship programs in 2005 as the first employer to launch a U.S. Department of Labor Registered Apprenticeship program for pharmacy technicians. Since then, we’ve placed more than 1,500 colleagues in Registered Apprenticeship career tracks in retail pharmacy and management. And we’re committed to doubling that number over the next five years. We’re currently the sponsor of two Registered Apprenticeship programs. Career Prescriptions for Success (CAPS) was piloted in Detroit in 2005 and later replicated in other cities. Participants receive classroom and online instruction, professional mentorship, and on-the-job training, as well as pre-employment and post-placement retention support. Apprenticeship provides structured training to maintain the high level of skill required in the pharmacy care industry and arms the participants with a nationally recognized, portable credential that will help them advance their career, whether or not they decide to remain with CVS Health. As we continue to build our Registered Apprenticeship program, we’re considering expanding our apprenticeship offerings to other areas of our business, such as pharmacy benefit management, specialty pharmacy, nursing and digital. Terrance Mack began his career at CVS Pharmacy in 2012. He was hired after receiving resume writing and computer training through the Michigan Works Apprenticeship Program D-RAPP. Mack had a retail and logistics background but needed to retool his skills after being unemployed for nearly a year. He serves as an Assistant Store Manager and is on his way to becoming a Store Manager. For their efforts to create an inclusive workplace, two CVS Health colleagues were honored by Creative Workforce Solutions.